Here are the gifts I made this year. This lentil bead necklace is a descendant of one of my earliest necklaces, and was actually a Christmas gift for the same sister. I hope she agrees it’s an upgrade. This one was a very easy baby to make :). The next necklace was for a Boxing Day birthday. looks simple but it took a huge amount of time to make. 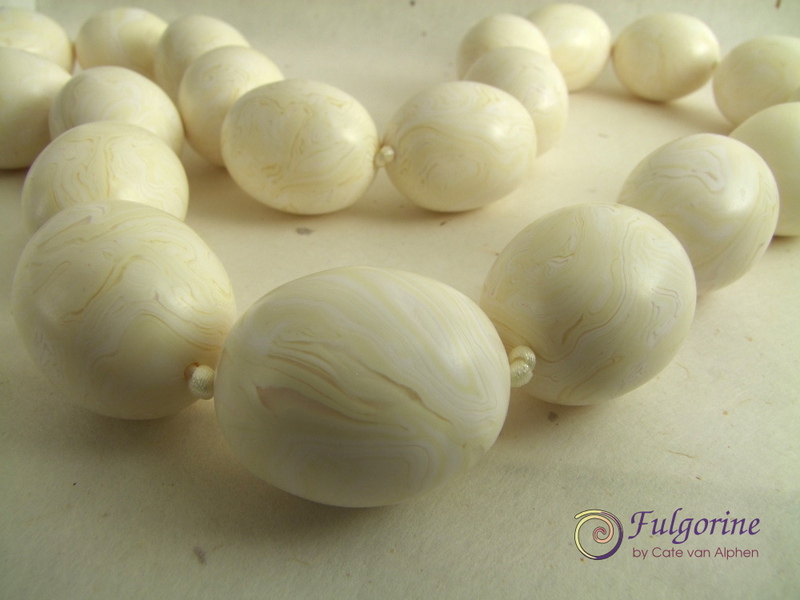 For the surface decoration of the beads, I made a marbled cane using ivory, lots of white and transparent polymer clay (I had to redo some of them since my first cane was too yellow – doh!). 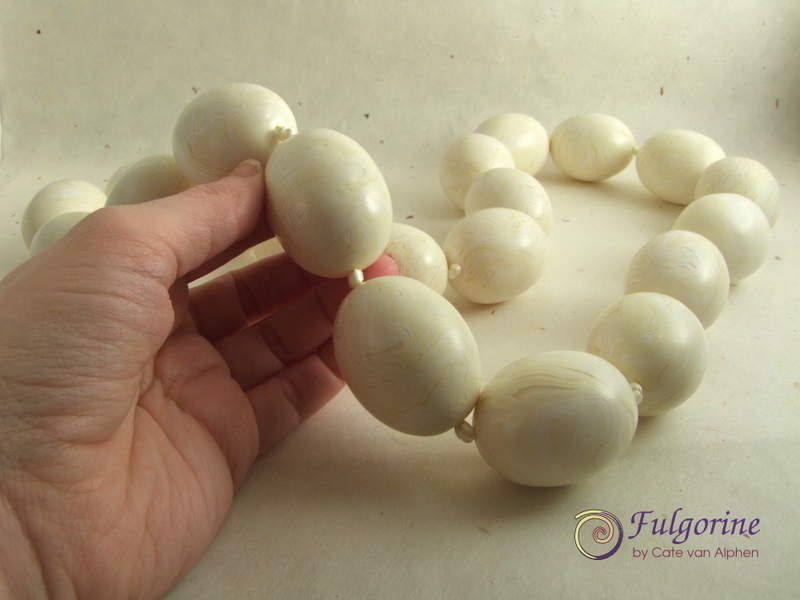 Here is a tutorial I did for a marbled cane which in turn was based on this tutorial for mother of pearl. 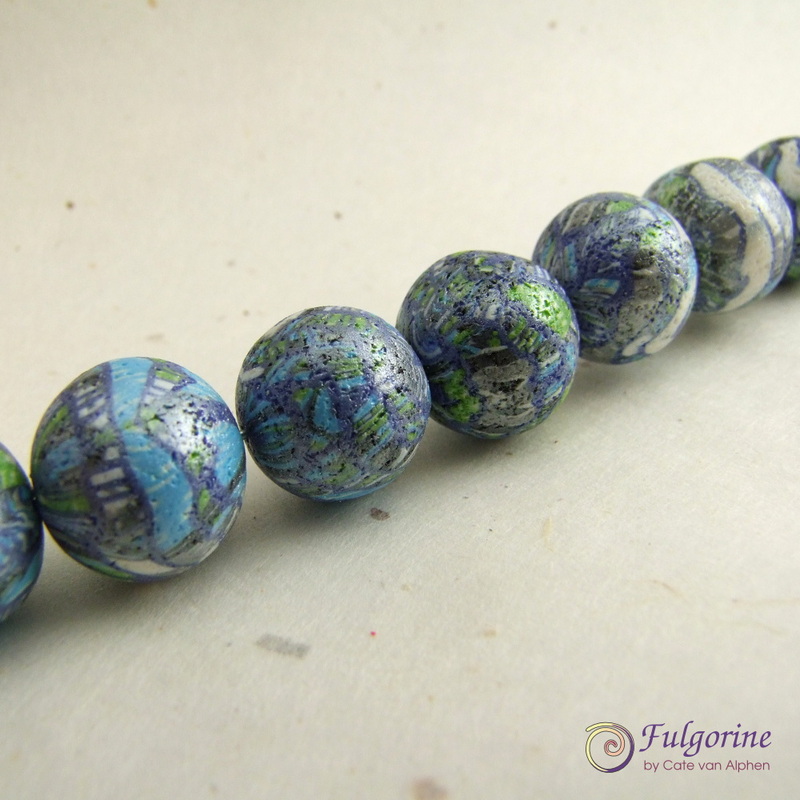 I’ve had to accept a work in progress for this week’s focal bead. All the extra Christmas activities have been taking their toll on my time. 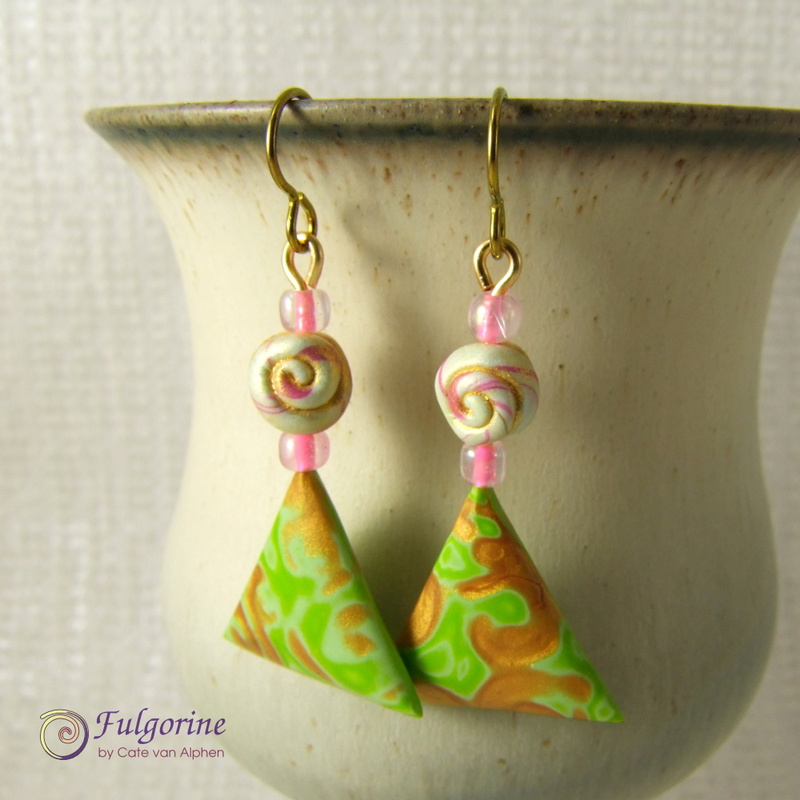 The pattern on the bead is a crushed helix (or reduced Damascus Ladder). I still need to finish the ends (I’m going to wrap a string of polymer around the domes) and sand the bead. Maybe I’ll finish next weekend (sometime after I finish making Christmas gifts, and beads for next week’s challenge but before we go Christmas shopping)? Hmmm, ok, maybe not NEXT weekend, but surely before the end of the year? Oh wait, that’s only two weeks away! I mentioned in my previous post that keeping my colour recipes in percentages helped with mixing gradients. that ends up as beads. At other times e.g. 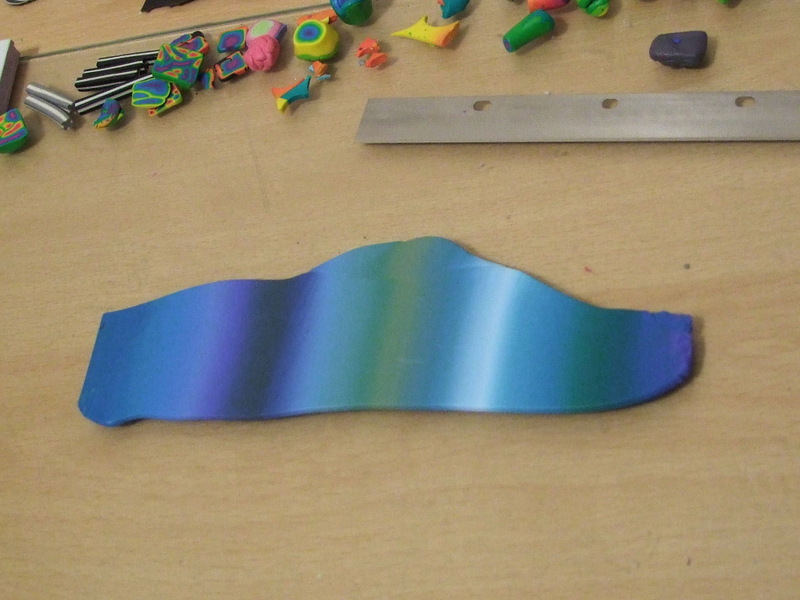 for the Art Bead Scene challenge pieces, I want my gradient to include specific colours to match the inspiration painting. I take my grid paper, and using 1 square to represent 10% of the recipe, I mark out the target colours. I leave spaces between them to allow for a gradient blend. I chose to put the bordeaux in the middle for the mustard colour on the right because it was such a small percentage I thought it would be difficult to cut accurately if it were on the bottom. Then I mark diagonals for the blends. I chose to fade to white on the edges. 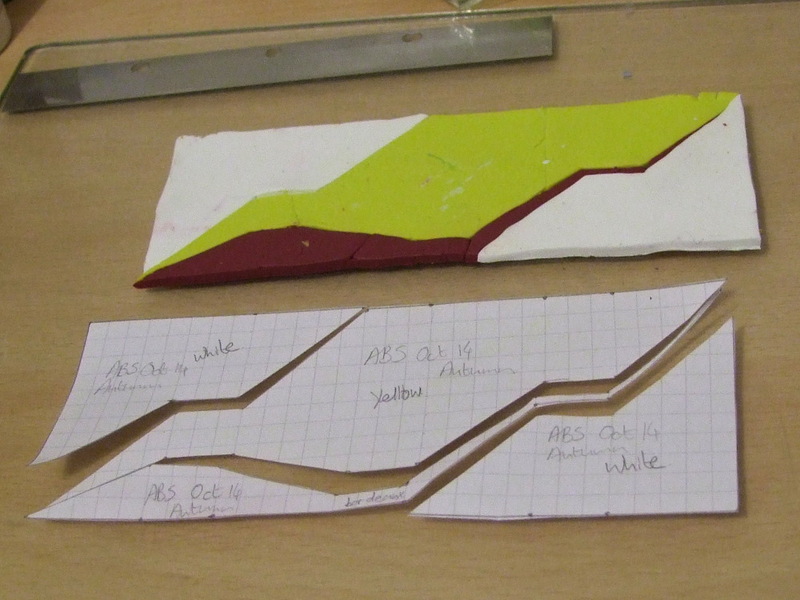 Then I cut out the paper shapes to use as a template for the clay. Here is the resulting blend. 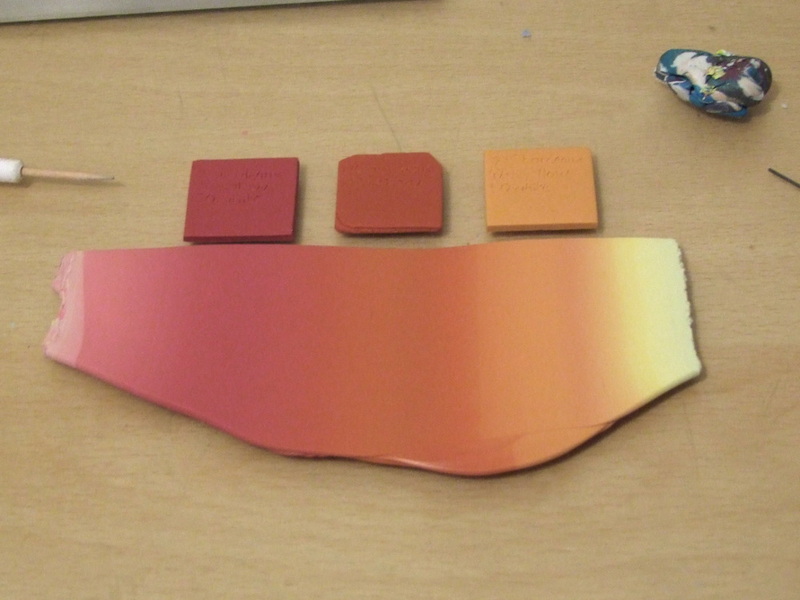 I’ve included the target colours – there is a slight difference as the swatches have been baked while the blend is still raw. This method means I can mix the colours at the same time that I make the blend (instead of mixing the 3 colours separately and then blending them). 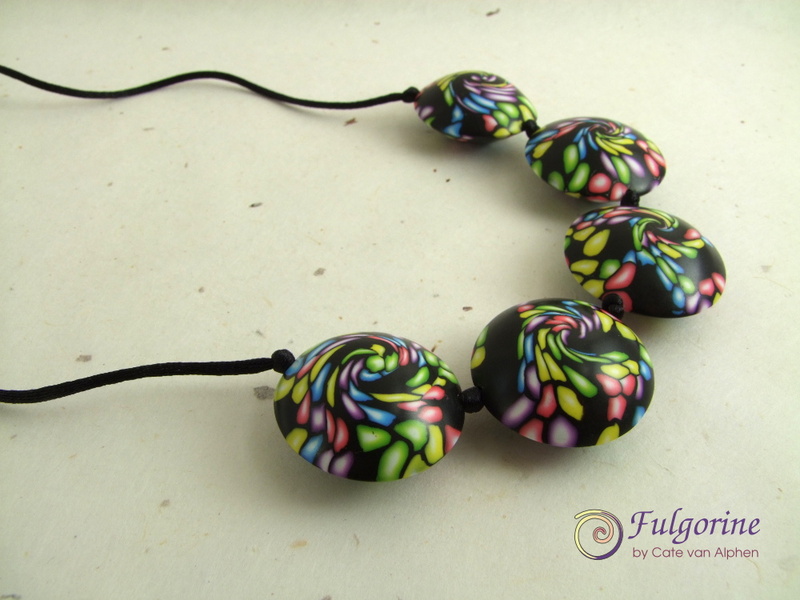 And here are the beads I made (with an additional magenta colour). Since then I haven’t been able to stop myself adding pearlescent powder just about everything. Kanji pendant by Cate van Alphen. The symbol means “friend”. It is available in my Etsy store. 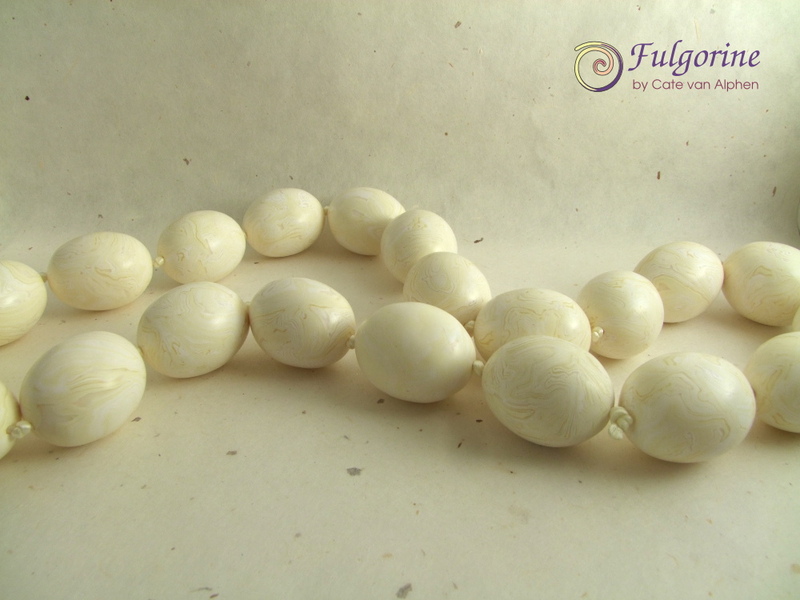 These are Stroppel round Natasha beads. See my free tutorial for how I made them. 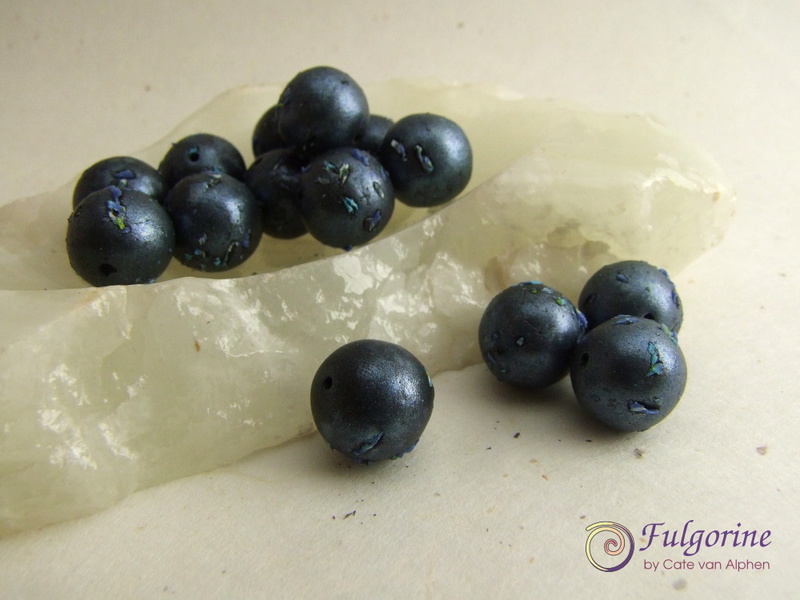 Yes, I only have one colour of mica powder at the moment, but I have ordered a few more… so watch this space for more pearls of polymer clay. In other news, I have received my Art Charms 🙂 but you will need to wait till after the reveal on 14th November 2014 to see my treasures as I want to include some of the artists’ inspiration. 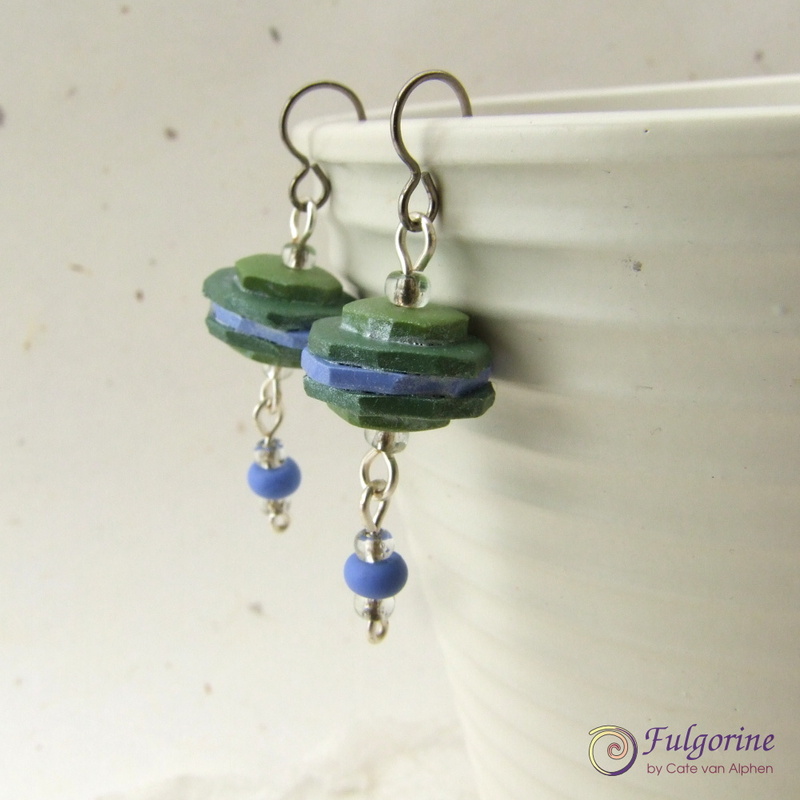 I was inspired by Sonya Girodon’s necklace “Skeleton Coast“ to make beads by stacking layers of polymer clay. 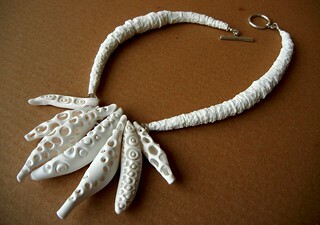 Anyway check out Sonya’s work, she even shares a tutorial for making beads similar to the focal ones in the necklace. A while back, with the help of this blog post about photo backgrounds, I decided I needed to pep up my plain white cartridge paper backgrounds. I thought the purple inclusions were just too distracting. So I decided I needed to buy some handmade paper. Then I thought: “Hang on, I have hands, I can make paper!”. I don’t think this is the proper way to make paper, but it works. 🙂 A few years ago, I even used this method to “paint” landscapes (excuse the retro quality of the photo). 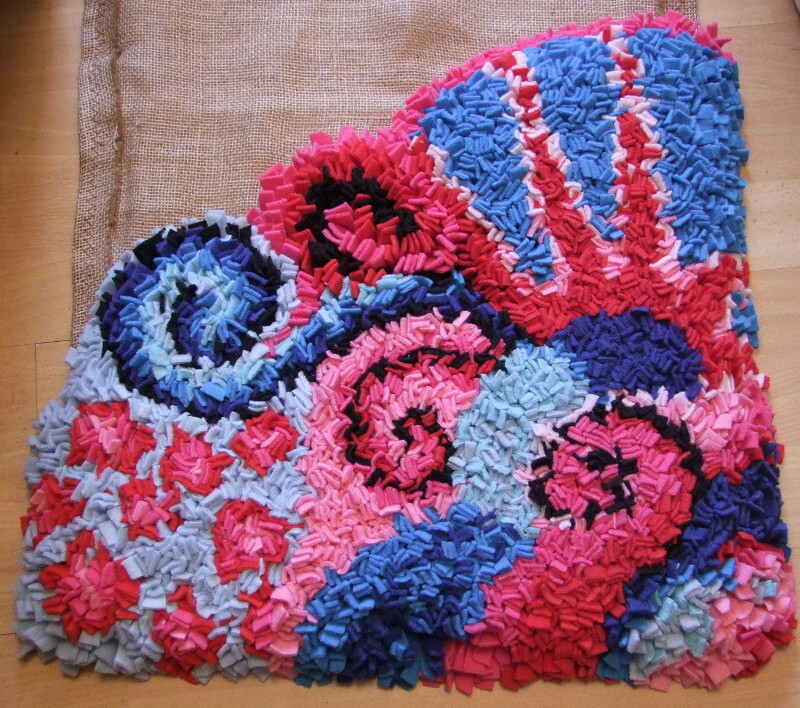 Scatter a layer of torn up cotton wool squares and scraps of toilet paper or tissue on a sheet of sculpting mesh. 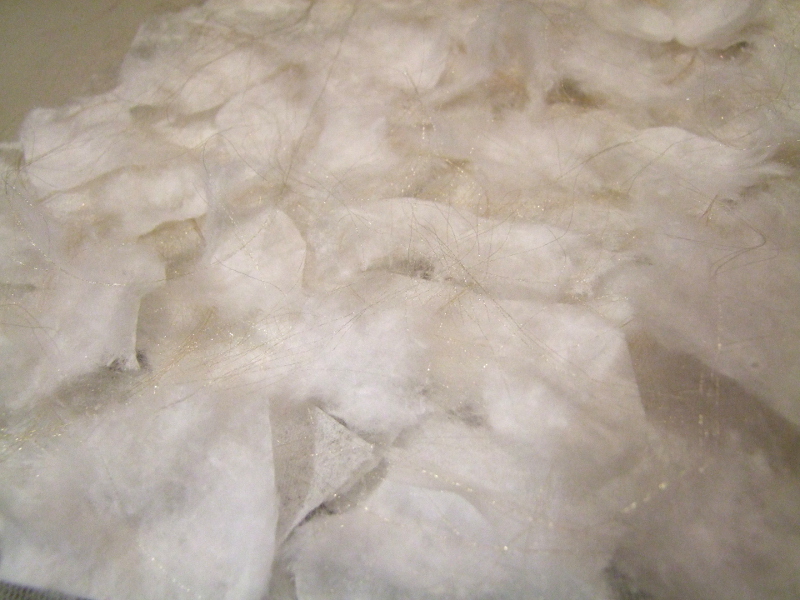 Then I separated the fibres from an off-cut of gold organza fabric and scattered these over the top. 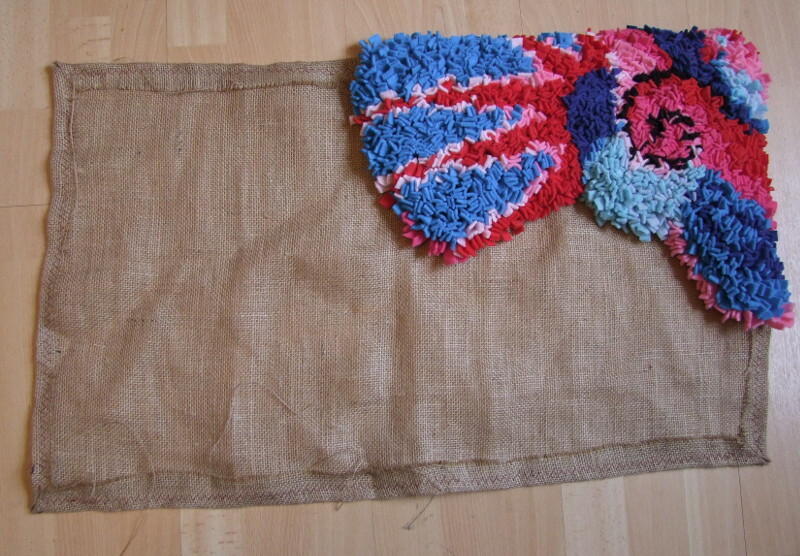 I think you could use strands of cotton thread if you don’t have fabric off-cuts lying about. 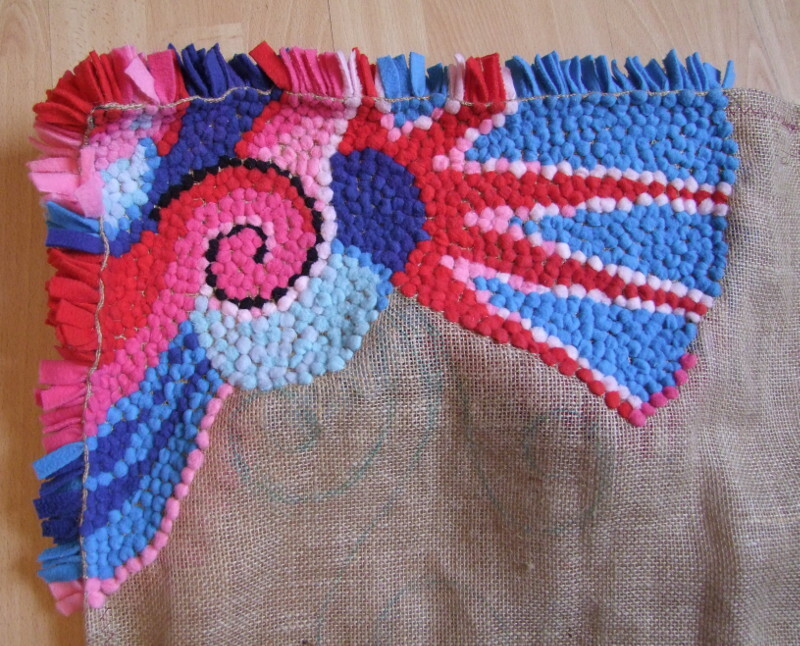 Repeat the layers of cotton, tissue and fibres several times until there are no holes. 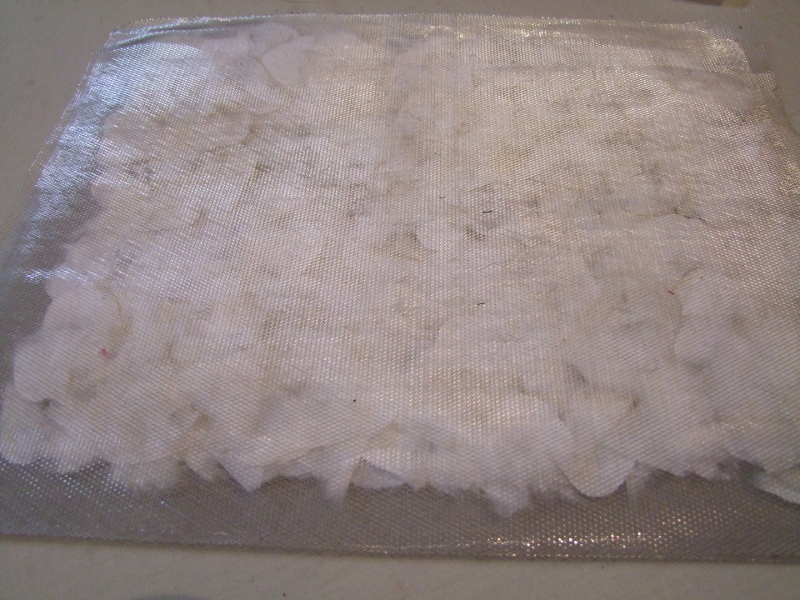 Cover with a second sheet of mesh. 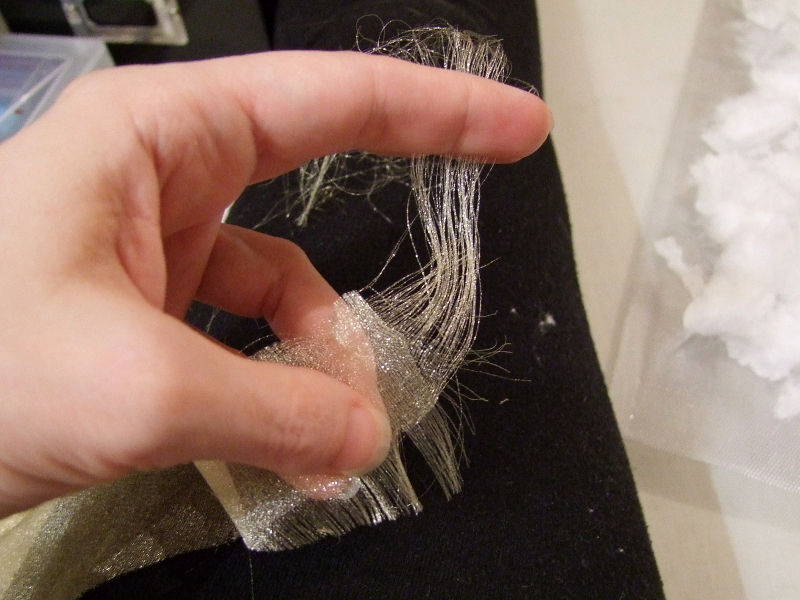 Now rub wallpaper paste through the holes of the mesh. Turn the whole lot over and repeat on the other side. 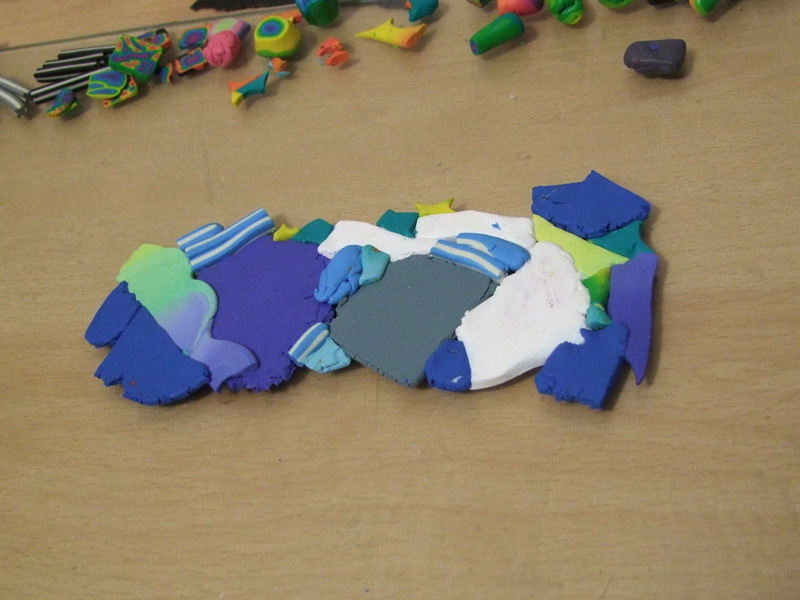 You want to make sure that the glue saturates all the layers. The next step is the most difficult – waiting for it to dry. 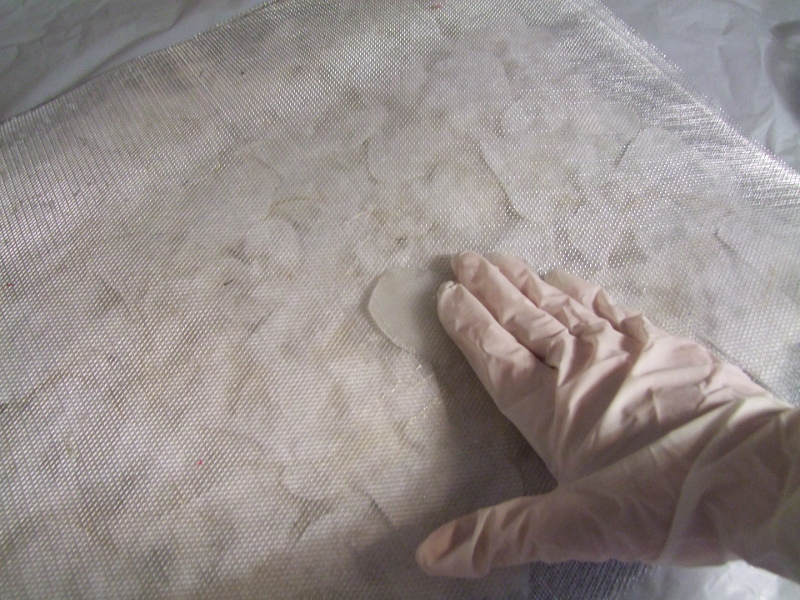 Once it is dry, carefully peel off the mesh (try not to stab yourself on the edge of the mesh – no one actually wants to see the blood, sweat and tears on the finished creation). 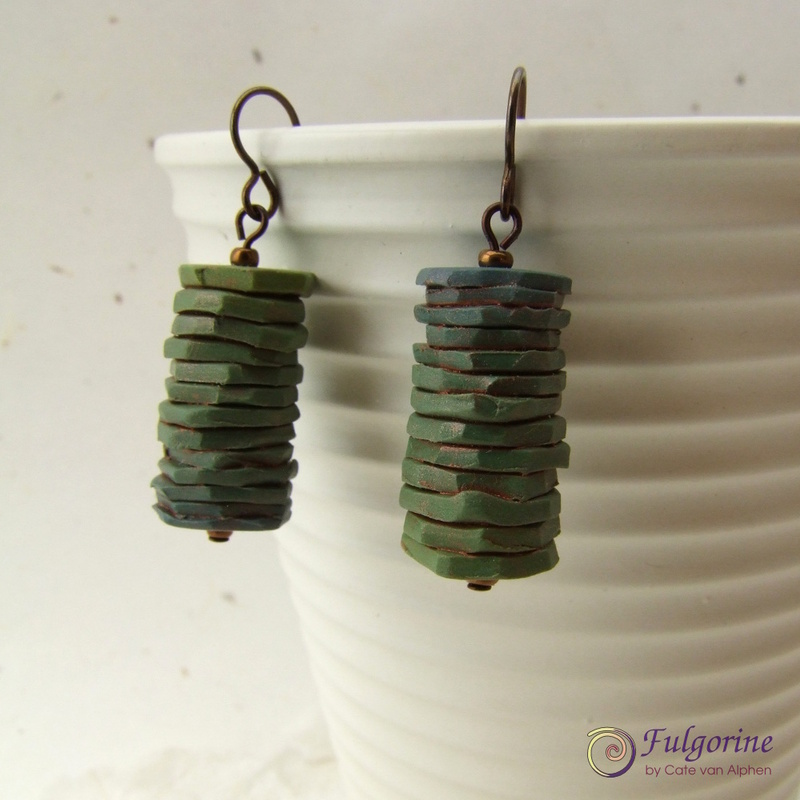 While I was waiting, my little owls flew off to a new home, so I chose the next most neutral earrings I had to photograph with the new background. 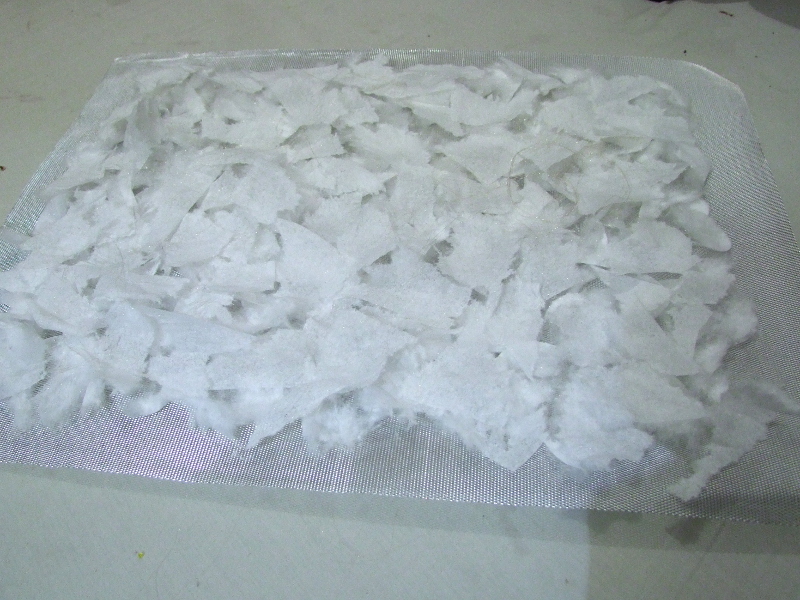 There are a few hard edges from the cotton squares which I should have shredded more thoroughly. What do you think? Better? Here are some videos of the demo I did at Craftworkshop making mobius Christmas ornaments. 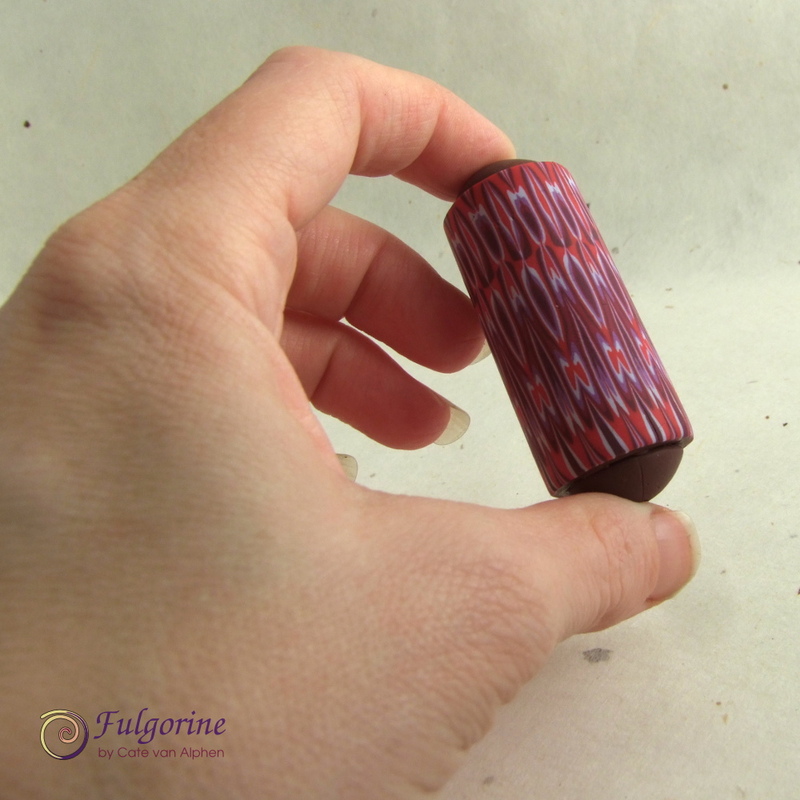 The first video has some information about using metallic clay, and I made a jelly roll cane. Next I made a surface sheet with an Easy Peasy Extruder Cane thanks to Ron Lehocky (see this article about him – he’s made over 24,000 hearts to sell for charity!). Finally I make the ornament and… it all goes wrong! Don’t rest your ornament on a tile to bake – suspend it from a bead pin or try to support in some way (perhaps with balls of foil).